:In the corner of a stable where the animals usually eat there is a baby in a blanket lying in a box.This baby is the Son of God who has been sent to save.In this book you will find out who needs saving and how it is that this special Child will do it. Carine Mackenzie wrote her first book, Gideon - Soldier of God, in the kitchen of her home in Inverness, Scotland with a two year old at her playing her feet. Carine now has over 50 different titles in print and sales of over 3 million books. 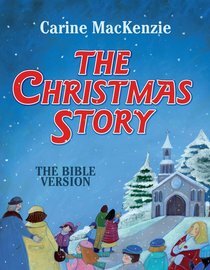 Her talent for retelling Bible stories has meant that children from all over the world have been given the opportunity to discover Jesus Christ for themselves. - Publisher.